Summer Fun Day, Belbroughton, Worcs - Sunday 9th June 2019. Championship Show, Markfield, Leics - Sunday 14th July 2019. Show Schedule and/or Entry Form are now available to download on our Results/Schedules page. Results and judge's critique from our Open Show on Sunday 10th February are available on our Results/Schedules page. Write up from our Summer Fun Day on 10th June 2018 is on our News page. For more details on all of the above events and shows, please visit our Events page. PUPPY AWARENESS WEEK (PAW) - please visit the Kennel Club's Puppy Awareness Week pages to learn more about the best way to find a happy healthy puppy from a responsible breeder, and their campaign to end the cruel practice of puppy farming. 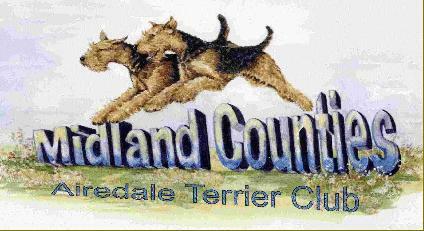 If you are looking for an Airedale Terrier puppy, please always do your homework carefully and find a reputable breeder, preferably one registered with the Kennel Clubs Assured Breeder Scheme. Click here for more information. DOGS LEFT UNATTENDED IN CARS - an important reminder from the Kennel Club which is particularly timely during the summer months, but which is important throughout the year, as even on what may seem like cooler days cars can still heat up very quickly. Please click here to read The Kennel Club's press release and click here to view a very informative short video warning of the dangers of leaving dogs unattended in cars - entitled 'Don't Cook Your Dog'.